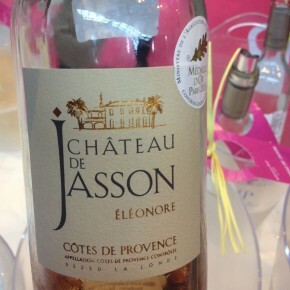 On Monday we tasted a ton of the new millessime 2012 Rosé wines on offer at the wine fair in Hyeres. 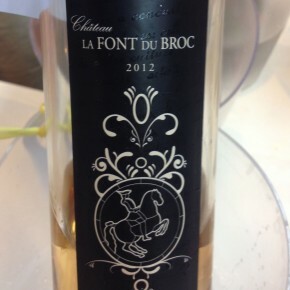 The Côtes de Provence label is now the most prestigious appelation for rosé wine in the world. What we learned is there are many kinds of rosé wines. There are the old school wines that we traditionally think of which are dark pink color, made by mixing red and white grapes. This process is forbidden in Provence, deferring to more refined techniques of leaving the wine in contact with the skin for short periods during pressing which gives it a hint of rosé color. This year there were 173 rosé wines to be tasted at the event. We stayed toward the high end rosé wines, tasting a little over thirty wines. The famous rosé wine produced on the winery now owned by Brad Pitt and Angelina Jolie. We were quite excited to taste this one, since there has been so much commotion over their online sellout earlier this month. However, I was really surprised about the quality of this wine. A classic mix of Grenache and Cinsault the Cuvée Pink Floyd was flawless. A bright flavour with a smooth finish and just the right amount of tannins for a sunny summer day. The price (between 4-6 euros wholesale) cannot be beat, and we even loved the unique bottle shape and innovative label. Some sommelier friends at the event were ecstatic about this wine, and it created a mini-buzz by the tasting tables. I must be honest, I had tasted a lot of wines at this point, and I did think it was very good, but my palette was a bit knackered. I can tell you that it was a hearty color and the price point at around 11 euros was a bit cheaper than many comparable wines of the same quality. This was another suggestion by the sommelier group we were with, and I especially loved the color of this wine. The taste had a little more character than the light rosé wines I adore. It had nice fruit and smooth finish, but at a price of 12 euros per bottle. A discovery for me was the even, well mannered rosé of our neighbors at Chateau Pampelonne. It is a safe bet at under 10/11 euros a bottle, and will not offend anyone. It has a perfect color, and complex mix of grapes. While it was pleasant, I am not sure I will be serving it this summer at our table. This much reputed Chateau produces deeper rosé wines, with an altogether different character than the light smooth rosés we drink all summer long. I think this mix of Grenache and Cinsault is aimed at people who dine with Rosé, rather than those who drink it before and during a meal. The 12 euro price places this square bottled icon at the top of the price range. Is it worth it? Not for us. If you are looking to step outside the mass production of the likes of Berne, and Esclans, a nice reference on the high end is Domaine de la Croix. The winemakers at the domaine have made some major investments in their pristine vineyards and produce an excellent light rosé, that is one of my personal favorites. While the color is closer to white than rosé, for me this mix of Grenache, Cinsault and Tibouren is light and perfect for summer days, without having to drown the wine in ice cubes to freshen it up. The 12 euros price tag is a bit high for everyday lunch, but hey, you’re worth it! A famous name these days in California, especially in Hollywood, Whispering Angel is one of my summer favorites. Not that this winemaker has any charm, Mr Lichine’s reputation precedes him in any winemaking circles, but his product is hard to criticize. At 12 euros a bottle, Angel is high end, but it does not dissapoint and is a reference for complex mixings of varieties (with Grenache, Cinsault, Syrah and Vermentino grapes). If money is no object go for the Angel. Of course I am a bit biased, but for me Pétale de Rose is simply the best. The reference for today’s modern rosé wines, Régine Sumeire, never lets us down with the quality of this cuvée. Some years have small changes in character, but this year’s stays true to form. For me the color is a bit dark, but the taste is perfect blend of Cinsault and Grenache. Her attention to detail and careful control of her harvest continues to set this wine above all the rest. At 12 euros a bottle the quality/price ratio is in perfect harmony.